For a while now, I’ve been wondering if my cheesy caramelized onion tart would still work if I used sweet potatoes instead of russets as the crust. I have a hunch it would be fine/delicious, but today is not the day we’ll find out. You know how I was talking about sharing more simple, everyday recipes? I decided this should be one of them, and, in my opinion, grating three sweet potatoes, forming them into a crust, and then pre-baking them for 45 minutes is not my idea of an effortless brunch dish. I have a running list of blog recipe ideas. Every week, I usually share one of my recent gratin recipes, one recipe that I’ve made a couple times with great success, and one recipe that requires from-scratch development. An egg bake has been on my list, in the latter category, for months. I’ve been avoiding it, because doing a comfort food, throw-together-the-night-before, lazy-weekend-morning-worthy egg bake isn’t exactly intuitive if you plan to keep it meatless and gluten free. My best egg bake memories, which have my mouth watering as I describe them, are filled with bread cubes and greasy crumbled sausage or bacon. They make me want to shout out an “amen!”, eat a couple huge pieces of egg bake (maybe with a side of bacon), then drive to church with the family. Unfortunately, I’m not as gleeful once I have a pile of greasy breakfast meat and gluten sitting in my stomach first thing in the morning. 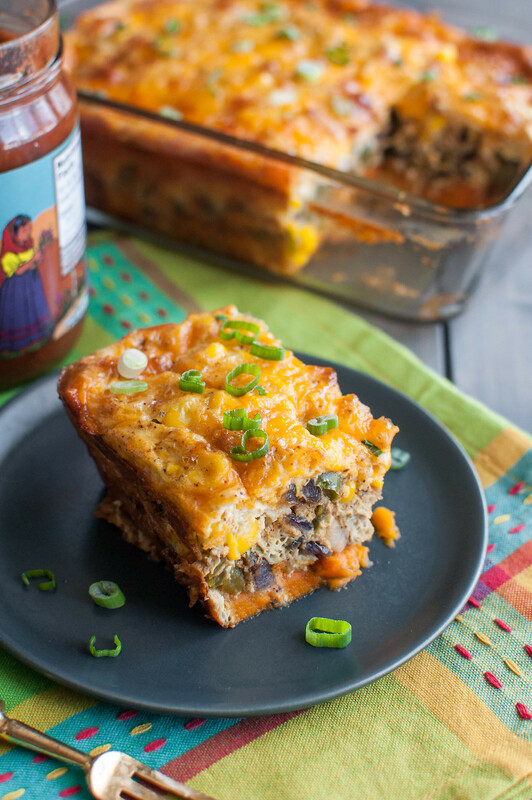 So the question is, how do I make a one-dish brunch bake that’s both hearty and healthy? I don’t think a delicate, shredded potato crust is the answer, because, in the absence of bread, chunky, obvious carbs are needed. The answer is big chunks of flaky roasted sweet potato that bake in the same pan used for the final dish, while you prep the rest of the dish. Talk about streamlined. No slicing your knuckles off on a box grater at 11:47 PM on a Saturday night when, instead of sleeping or getting rowdy with your fourth vodka soda, you’re making sacrifices so everyone has a stellar Sunday morning. A Sunday morning during which you fully deserve a couple blood mary‘s or mimosas. As it turns out, the roasted sweet potato chunks, if you size the potato and the pan right, still form a crust, even thicker and heartier than if they were shredded. Sweet potatoes are always a flavor challenge for me–I just don’t like the overwhelming sweetness on its own. My baked sweet potatoes are almost always unrecognizably covered in sour cream, cheese, or avocado, plus butter or oil and loads of salt. With this egg bake, there’s just the right proportion of flavor, savory ingredients, and contrasting textures that I actually enjoy the sweetness of the potato. High five for me. 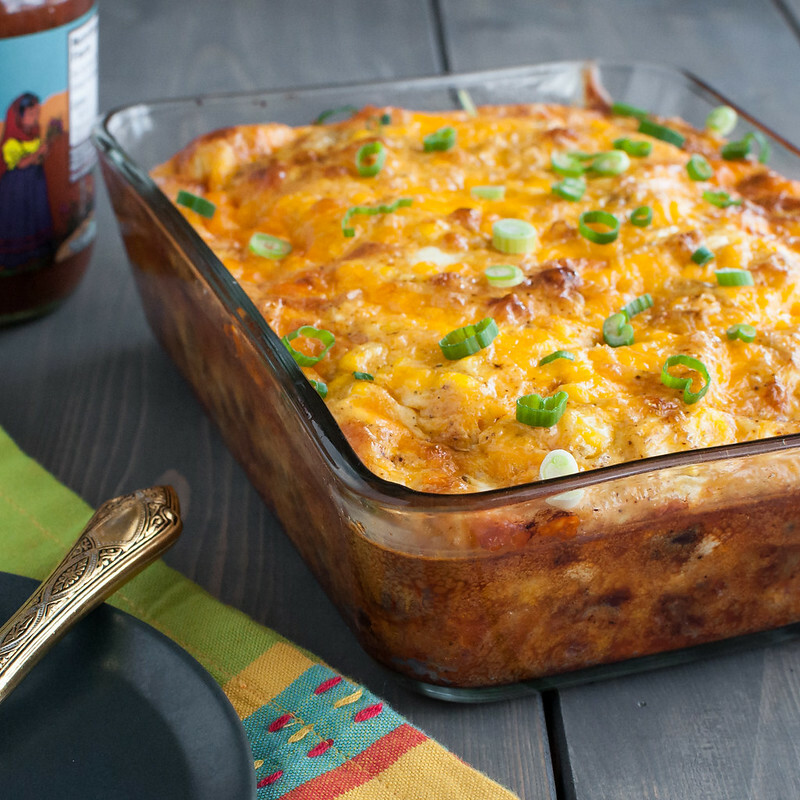 No matter how busy your weekend, you have time to make this breakfast bake. Take me, for example. We have four houseguests (aka, friends), over a week in Dallas to pack for, and a wedding celebration on Saturday night that will likely be hangover-inducing. 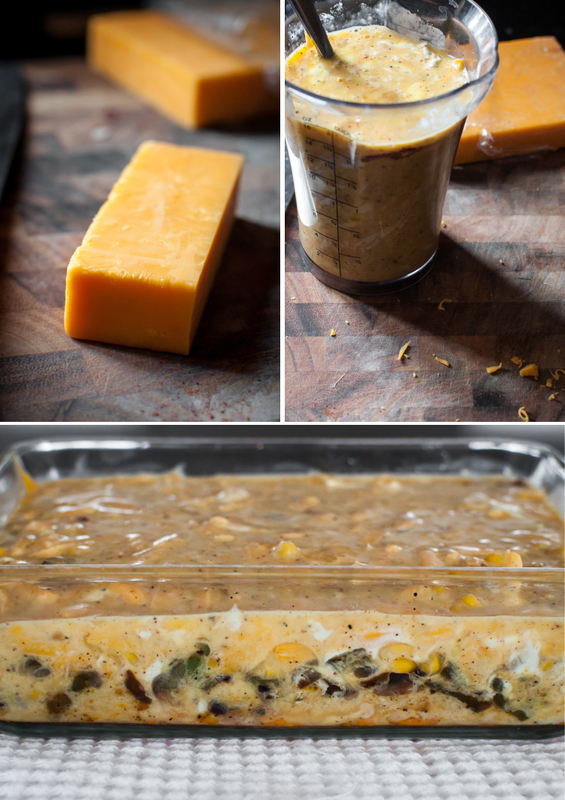 Getting on a plane the day after a super fun wedding party is one of life’s greatest cruelties, but I think I can find an hour on Saturday to grab the few fresh ingredients I need to produce this breakfast casserole for the second time. Pop it into the oven while I shower and generally collect myself Sunday morning (easier said than done) and boom! Breakfast for everyone, so we can all go our separate ways on a full belly. You'll most likely want to double this recipe and bake it in a 9 x 13 inch pan. It's highly flexible and conducive to adding just about any veggies, aromatics, spices, or even meat. Preheat oven to 350 degrees (F). In a 6 cup baking dish, toss sweet potatoes with 2 teaspoons olive oil, ¾ teaspoon salt, and ¼ teaspoon pepper. Roast in bottom third of oven for 25 minutes, stirring once halfway through, while you get everything else ready. When potatoes are done (they will be slightly undercooked), remove from oven and increase temperature to 375. In a medium skillet, heat another 2 teaspoons oil over medium high. When shimmering and hot, add onion and pepper. Cook until just softened, 4 to 5 minutes, then add 1¼ teaspoons chili powder, ¼ teaspoon salt, and a pinch of pepper and cook another 30 seconds, until the chili powder is fragrant and vegetables are slightly browned. Set aside. Whisk together the eggs, sour cream, ½ cup cheese, ½ teaspoon chili powder, ½ teaspoon salt, and ¼ teaspoon pepper. 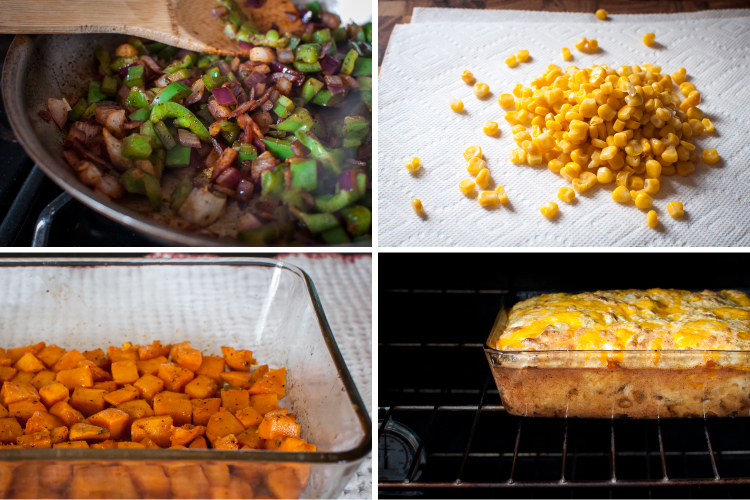 Make sure the sweet potato cubes are evenly distributed, then layer the onion mixture and corn kernels over the top. Pour the egg mixture over the veggies and gently (and carefully, as it's still hot) shake the pan to help the liquid work its way into all the crevices. Sprinkle the top with another ¼ cup cheese. Bake at 375 for about 25 minutes, until eggs are just set and top is domed and starting to brown. Cool slightly, then cut into pieces and serve with more sour cream, salsa, guacamole, and/or cilantro. 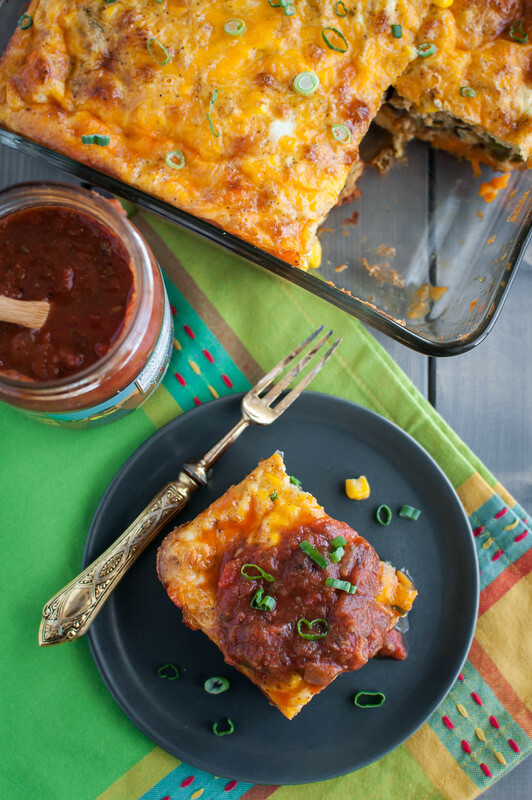 For a complete breakfast or brunch menu, serve with stewed black beans, warm tortillas, and/or a side salad. Can also be served cooled to room temperature. The recipe is gluten free and vegetarian. As always, check ingredients on packaged items in the case of allergies. For strict vegetarians, use cheese made with vegetable-based rennet (ingredient list will specify). Prep time listed is for prepping the potatoes for roasting--the only step that can't be done while you roast the potatoes. 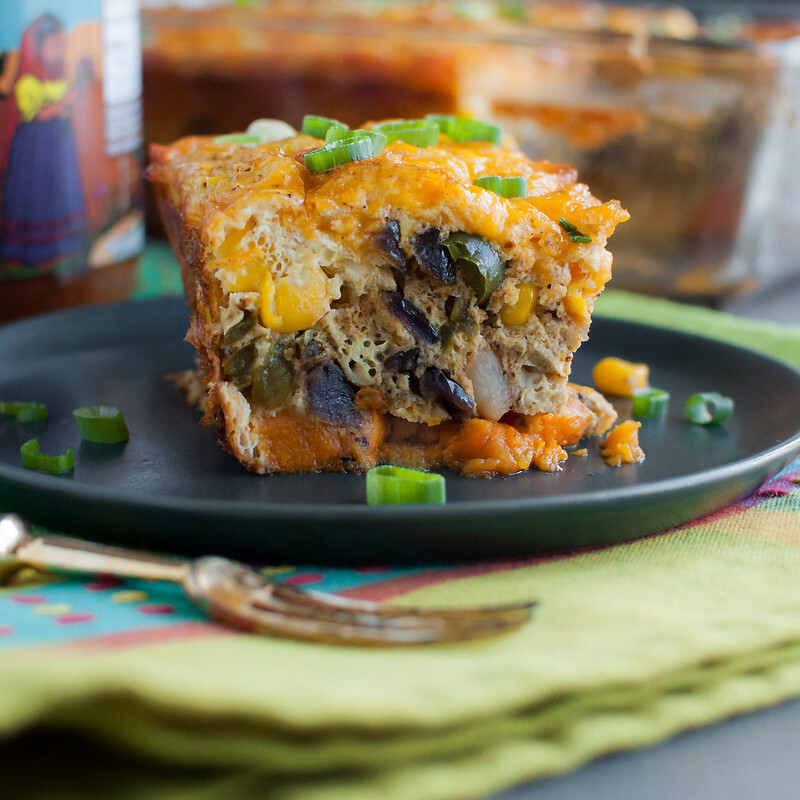 You could easily make this recipe with meat or black beans. Bacon, sausage, or even pulled pork would work well. Fully cook any meat before assembling the bake. Add 2 eggs to ensure there's enough egg mixture to cover all the ingredients. I'm not a fan of storing cracked, raw eggs in the fridge, but it seems to be fairly common internet knowledge than you could refrigerate the bake overnight after assembly, then bake it in the morning. My choice would be to assemble the veggies in the pan and grate the cheese the night before, so all I had to do in the morning was quickly mix up the egg mixture while the oven preheats. For a make-ahead weekday breakfast, the egg bake keeps in the fridge a couple days, then freeze it in individual, foil-wrapped squares. Warm in a low oven while you get ready, or unwrap and microwave once you get to where you're going in the morning. Note: This page contains affiliate links. It does NOT contain sponsored content. 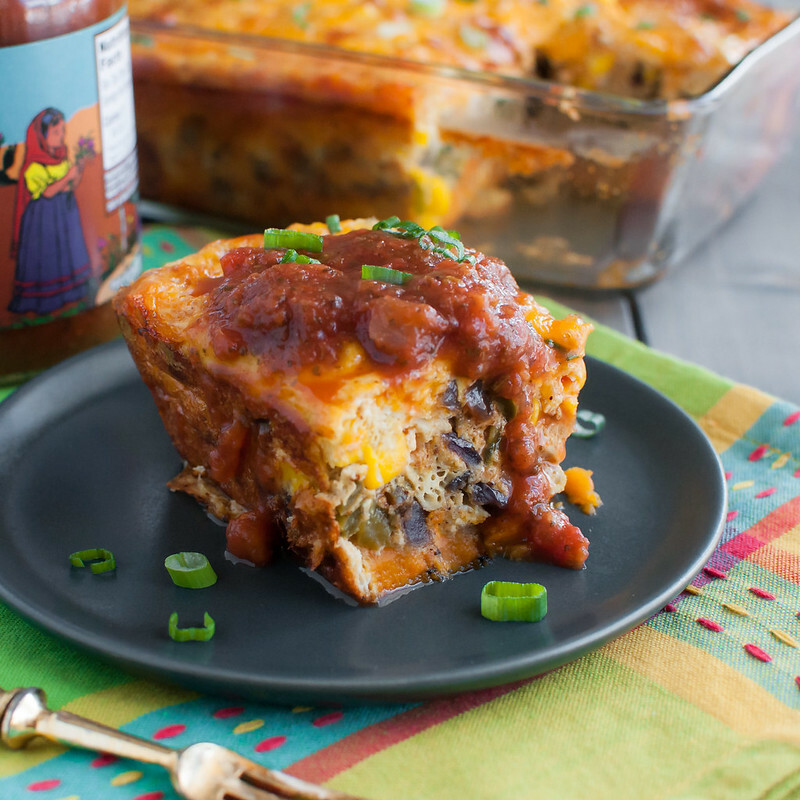 Affiliate links (to products I recommend, on Amazon) offset my ingredient and website maintenance costs, so I can keep bringing you weekend-friendly recipes like this one. Thanks!